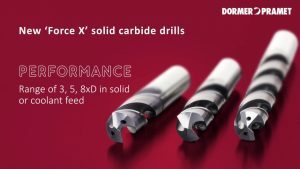 Force X is Dormer Pramet’s latest range of multi-application solid carbide drills. A variety of options are available, with different lengths to support drilling to 3xD, 5xD and 8xD, as well as an accessible range of through coolant versions. These drills deliver “new levels of performance and outstanding economy across diverse conditions and material types”; where each Force X Drill includes Continuously Thinned Web (CTW) technology, providing a very strong web design – reducing thrust through drilling.